Summer is setting in, and that means, for most of us, it’s time for travel. There is no doubt, traveling is a stressful event for most people. Even if your kids are excited about going on a big adventure, the disruption to routine that comes along with travel is enough to throw off even the most cheerful children. Whether you are planning a road trip or taking a flight to your destination of choice, you’ll want to do all you can to make sure your kids stay as calm as possible. And if you’re bringing a pet (or pets! ), I’ll drop a couple tips to keep your fur babies calm too. Implement my tips below to keep your little ones, furry or not, calm and collected during your next summer trip. Travel preparation begins long before you load up the car or step foot into the airport. You may have noticed that the days and even weeks leading up to your trips are packed with extra to-dos and stress, and as a result, not enough sleep. It’s likely your kids are also affected. They feel the added stress and may be losing sleep along with you. If there’s one thing that’s sure to foster extra fussiness in your kids, it’s lack of sleep. Make it a priority to adhere to your child’s normal sleep schedule in the days leading up to your vacation. That extra hour of sleep your child gets the three nights before vacation can make or break her mood when it matters most. Make this a non-negotiable. If that means you need to start planning your trip a few days sooner than usual, make it happen. Not as easy, but doable, is the sleep your child gets during the vacation itself. You don’t have to be the time keeper every single night, but for two or three nights before your departure, if you get your kids to sleep on time, your chances of sailing smoothly through your six-hour flight will be greatly increased. You may have to ward off a few “But mo-om!”s, but trust me, it’s worth it. Did you know that what your child eats can have a huge impact on his behavior? Many parents miss this important link. If your child is naturally a handful, or even has a diagnosis of ADHD or autism, if you haven’t experimented with his diet, you’ll want to get a head start on it. For many children, eliminating foods that your child may be sensitive to, like, gluten, dairy, sugar, and even corn, soy, or peanuts, can work wonders on improving behavior. I’ve heard countless success stories, and read studies that back this theory up. In the weeks or months leading up to your vacation, cutting gluten, sugar, and maybe dairy out of your child’s diet can make a big difference. You could even implement a full elimination diet, but you’ll want to do that with plenty of preparation. And if your child doesn’t regularly eat sardines and salmon, consider a fish oil supplement, which won’t work short-term, but over time, adequate omega-3 intake can make a big difference in your child’s behavior. It’s worth adding to your child’s regular supplement regimen if you haven’t already. Children are busy creatures. They jump from activity to activity all day long. Sitting in a car or on a plane for hours at a time is not a normal day for a child. To combat their restlessness, you can pack some essentials to keep them occupied. First, be sure to pack plenty of healthy snacks and drinks. Relying on vending machines is a recipe for disaster. A nourished, hydrated child will have two less reasons to get irritable. Pack healthy snacks that are not high in sugar. Nuts, granola, apples, and yogurt are great options to hand out every couple hours. And keep plenty of water on hand. Sugary beverages are the last thing you want your child to fill up on while traveling. You don’t want to deal with the repercussions of a sugar high or a sugar low. If you think that I am going to recommend loading a few movies in your tablet to keep your kids calm, think again. Sure, you might be able to lull your kids into a daze with the screen, but their reliance on this method is sure to backfire on you later. Instead, why not download a fun-filled audio book or two? Your child can listen while still engaging with the world around her. Her imagination will be stimulated while she sits quietly, engrossed in a thought-provoking story. You can also pack some activity books to keep your children occupied—and their minds working. And for older kids on road trips, set them up with a camera and ask them to take pictures of your journey. Maybe they catch a nice shot of your family in the car, or of the mountains as you pass by them. Activities like these are perfect for avoiding that confused look your children give you after peeling themselves away from too many hours of screen time. If you haven’t heard of Back Flower remedies, you’re in for a treat. Their line of flower essences are perfect for travel time. Bach Flower Rescue Remedy, in particular, is one product I don’t leave home without. It’s perfect for bringing calm to stressful situations. Bach flowers work on an energy level to rebalance emotional states. And these mild products are completely safe, even for babies and pets. Does your dog hate to travel? 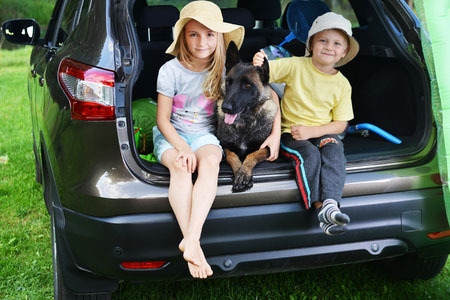 If a car or airplane ride is the last place your dog wants to be, you are not alone! You’ll want to try Vital Planet’s CALM for dogs. Formulated with nutraceuticals, herbs, and flower essences, CALM supports calmness and relaxation in dogs experiencing anxiousness and stress. The product comes in tasty chewable tablets or powder that you can mix into food or water. Next post I’ll take a look at your Summer Diet Reboot!